Are you a Weight Watchers success story? The Despatches special on Weight Watchers broadcast next Monday on Channel 4 is way overdue. The programme is part of the growing backlash against the dieting industry and will be turning its attention to dieting giant Weight Watchers and looking at how they make their money. It’s time we took a long, critical look at how it is possible for corporations like Weight Watchers to make huge profits from selling what is essentially a faulty product. 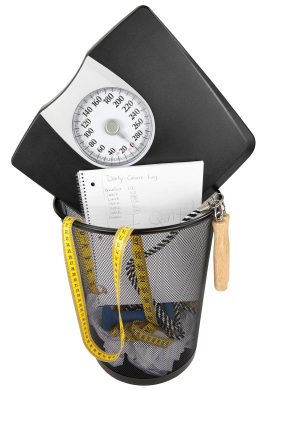 Numerous studies have shown that dieting does not work for long term, sustainable weight loss. Watch Sophie explain the phenomenon is this short video on one of our workshops many years ago. So if dieting in general and, in this particular case, Weight Watchers doesn’t work, how come (as of Wednesday 23rd January at 1pm) the Channel 4 website has 40 comments every single one of which is a Weight Watchers success story? Well, if we take a closer look at the glowing testimonials, it turns out that quite a few of them are from Weight Watchers Leaders, so those come as no surprise. The others seem to be genuine – happy customers who have lost weight and kept it off. Many of them talk about the great support network that Weight Watchers offer their members and most of them have been going to weekly meetings for years and years…and years… and years. But hey, if Weight Watchers has worked for these people that’s great. I’m delighted for them and relieved – because it would be truly horrific if it hadn’t worked for anyone at all! But wait. I have been working with women who are desperate to lose weight and who struggle with food for over a decade now. And I have seen thousands of women take part in our workshops and courses after years of failed dieting and nearly every single one has been to Weight Watchers, most of them several times over. They’ve been to the meetings, counted their points, followed the rules and any weight they have lost has eventually come back on, plus more. All these women have come out at the other end fatter, convinced that there is something wrong with them for not being able to stick to to the diet and for not being a ‘success story’. When I read the comments on the Dispatches web pages I think of all these women and wonder how they feel when they read them too? Do they feel like failures? Are you a Weight Watchers success story or are you one of the millions for whom it didn’t work? If you are, rest assured, you are not alone. You are one of the 86% for whom dieting is not the solution but the cause of years of misery and deprivation. My guess is that Weight Watchers have a pretty hefty PR machine in place and that it got to work pretty pronto as soon as news of the programme came out and the page was open for comments. I’m not doubting the testimonials are genuine but I know for a fact they do do not represent every woman’s experience of going on the Weight Watchers diet. I’m also convinced that after reading the deluge of glowing praise in WW’s favour, it would take a very confident person to post a negative comment on the Dispatches page. I’d like to restore some balance and offer those who don’t have that confidence a space to talk about what it is like for them. What it’s like to diet month after month, year after year and get absolutely nowhere. I’d like to open up this space so that we can Lighten the Load and talk about the shame, the loss of self confidence, the diet backlash binging, the secret eating and the desperation that come from dieting. So please, if you are NOT one of the women who can share a happy ending weight loss story, come and share here. You will be heard without judgement. No one will suggest that it was your fault and that you should have just shown a bit of resolve and got on with it. No one will tell you that you need to buckle down and make ‘healthy lifestyle changes’ – because if you really wanted to, you would wouldn’t you? By sharing your story here, you will be allowing other women to come forward and share their dieting “failure” stories. You will be helping to normalise what is happening to millions of women around the world at Weight Watchers meetings, day in, day out. The comments on the Dispatches web page are not the norm, they are the exception and it is important that as many ‘failed’ dieters, desperate to lose weight hear that too. How do you know if you’re ready to stop dieting? Just left a comment on the Dispatches website under the WW story. My comment is being reviewed for publication. Be interesting to see if they publish it. I shall watch this programme with interest. It’s about time the balance is redressed and the truth is highlighted. That’s great Karen, thank you. What was the gist of your comment? What is your success rate Audrey? As someone who needs to lose weight, I cant help but think that you would make disparaging comments about other slimming organisations when you are one yourself. £150 is expensive, so how do you make your money? Who am I to believe? I will also watch the show to make up my mind this January. Hello Olivia. I understand your skepticism. After years of spending money and time on diets that don’t work I completely understand that you don’t trust us either. The thing is we are not primarily about weight loss. If you read through our website you’ll see that our goal is for women to feel good about the way they eat and the way they look – our focus is on our relationship with food, not on the size of our bodies. Many women struggle with their eating and they don’t all want or need to lose weight. £150 is a lot of money, that’s true. And in response to feedback and demand we will soon be offering workshops for just £10. Thanks for your comment. I am going to attend your workshop tomorrow, and i have paid £150 for it. Is it true that it will cost only £10 soon? If it is the case, i would like to have my £140 back please. I am sorry if this sounds harsh, but i could not believe my eyes that you wrote that just yesterday! Would like to have an urgent reply as your workshop starts in a few hours. I was the same – WW did work for me in as much as I did lose weight but with it came a lot of negatives. I found my life was not improving as I was fearful of going out as I would ‘break my diet’ so was turning down invitations or attending, but so tense about the food that I was not enjoying myself. So I had the weight loss but no good feelings about it at all!! So I then ‘came off the diet’ and low and behold the weight came back on!! I am now following the BC principles. Tuning into myself and asking what I want to eat. It is a slower process (ie you do not lose 5 lbs in the first week of adopting this new mindset) BUT I am losing weight AND having tremendous fun in my life and ate a BLT with chips on Weds that was delicious!!! And the other big benefit? Finally I am peace with myself and have, through, tuning in etc come to have a healthy relationship with myself. Yes I understand the sceptimism but I would not go back to a ‘diet’ now for all the tea in China!!! I will be watching this with interest. Never done WW but many others of a similar ilk. Thankfully there are now some negative WW comments on there (Karen’s has been approved and is on the page) but interestingly each negative comment has a couple of replies which seem suspiciously like the PR machine in action. And what a machine it is! I’m fascinated by the uniformity of the comments – it’s a bit chilling. Have you read my post ‘size 10’? I’ll save you the bother. I’m not insinuating anything. This space is for people who don’t have any Weight Watchers success stories to share and who don’t define themselves by their dress size. You just seemed to miss the whole point didn’t you? There are a lot of people who will find success on WW. Maybe they don’t have the issues around food that so many of us do have. Maybe they have “super strong will power”! But having very very recently done a stint at a WW club (my last I hasten to add) I saw many people struggling just like me. They weren’t losing because WW and other diet clubs do not address the many reasons we fail on diets. They may gloss over points such as “If you’re feeling low, have a bubble bath” or “As a leader I eat emotionally, but I make healthier choices!”, but they don’t want to acknowledge that weight is a far bigger issue than food and exercise. I didn’t feel supported. I had even confided in my leader that I had found a lump and was waiting for a breast appointment “Oh I will support you!”. The way she supported me was by telling me and the whole group that one of her members at another group had only found their lump because they lost weight, and so it was so important to keep losing weight. She didn’t even ask me my result. Supportive? Not for me. For me, it was a revelation though. I had been placing all my sense of value on a weight loss group. My value was based on whether I lost or gained, whether I’d stuck to the plan efficiently, or whether I’d let myself go. I’m bigger than I was before. But today I am happier. I’m making choices based on my wants and needs, which, it turns out, don’t all revolve around how big I am. I am one of those women for whom Weight Watchers didn’t work, neither did Slimming World or Rosemary Conley, or Atkins, or Slim Fast or anything else. I lost weight using similar principles to the Beyond Chocolate ones, which I only found after I lost the weight and the guilt and developed my relaxed relationship with my body and food. We need to stand up and challenge these giants who are still taking advantage of women when they are low and vulnerable. I have lost count of the number of my friends who have told me, “I’m going back to [large diet company] because it worked last time.” But of course it didn’t work, because if it had, they wouldn’t need to go back! I’ve gone to SW and WW meetings and the one thing that has always put me off is that the majority of women there have rejoined. Doesn’t make sense to keep doing the same thing over and over when the result is the same: lose a few pounds and then gain it all back and more. I became a gold member of WW in 2003. I lost 8 and half stone. I changed jobs, moved house and stopped going to meetings and slowly the weight started to come back on. I returned 4 and half stone heavier in 2009. See what stopping does. With the support of my leader and a great meeting with lots of support from fellow members I got back to goal. Now maintened agian for more than 2 years. I realised meetings and support was the key to success ! Wow.. I also find it easier to mainten with ProPoints than I ever did with the old points system. Eat more nuts now and lots more protien in my food. I find low fat food the ProPoints are high cause they add lots of Sugary carbs in them so I eat less “diet” food now . Sorry if that is not the sort of comment you were wanting. But its the truth. The truth is always welcome here Debbie. Thanks for telling us what works for you. We know that support is crucial to making changes. Glad you found it in a form that suits you. Thanks for sharing your WW experience. All stories are welcome here, yours included Debbie. Would you be willing to tell us what works for you about Beyond Chocolate as well as what works for you about WW? Since you’re reading and contributing to our blog, I imagine that something brought you to us, to our non-dieting approach. Do let us know. Thanks. I just saw your “plug” on your dispathches post by one of the posters Thought beyond chocalate what is that. I am happy to look at other models that support people to feel good and reclaim control of food and other things in your life. Right away on your front page I saw you asking for people like me. Weight Watchers success story. I dont prentend to have won the “war” on food. Just a battle and doing well at the momenet keeping it off. I dont track any more either as I am maintening well. Most Gold members in my meeting no longer track either. I think our stomach have a lowere tollerance and I now know what foods I can eat tons off or healtheir options. Example vending machine at work if I am needing a fix I would pick Quavers as oppposed to “McCoys” yes I know the Quavers arent healthy either but you get the idea. But I eat tons of fruit now – real loads of it. I Really couldnt afford to come to your “weekend” away. I dont pay for weight watchers now. But even putting £20 a month away it would take me a long long time to save it up that amount. I do think different methods of getting in control work for different people and I suppose for people with money your methods may work . I also think folk need to really commit to making the change. Not I will loose my xmas, hoilday weight then come back.. I see members like that at Weight Watchers I am here to loose xmas ,, loose weight then disapear see them again in Sept.
What is that all about it? I think though if its your TIME to make a change it will happen. DO you know what I am meaning. Is is Weight Watchers fault? No..you have to commit day 1 to loose weight and make lifestyle changes. Yes you may gain weight at xmas, hollidays, severe time with stress but need to get up as soon as you can and get back to be healthy not weeks and months later. I think we are all on our journeys we should all support each other in finding the path that leads to the route of being in control. Not down other methods that work for people. Unless of course its “unhealthy” methods that would damage your health long term – then I am up for pointing out health concerns. I dont DIET. I eat food that is my diet. I persume you eat food so also DIET. I do follow a healthy eating plan and it works for me. Can’t wait for this to air. Dieting has ruined my body. I’ve lost and gained 4 stone plus another 2 on top of that. Dieting has made me hate my body and treat it with little care. I started dieting in 2006 and since then I have been diagnosed with depression, an eating disorder and diabetes. I will never diet again and I hope Dispatches will open the eyes of millions of women who are conned in to paying money to organisations like WW. I don’t think WW is out to ‘con’ women (as in I don’t think they sit in their offices rubbing their hands together and cackling as they count their piles of cash) but it is certainly time to give women like you who have had a bad experience with the dieting industry an alternative that works and that does not require lifelong attendance to meetings to ‘keep on track’. Did you ever think that maybe the diets fail, not the people? It’s much easier to blame individual people for not having the ‘will-power’, or the ‘determination’ or on some other personal deficiency than actually looking at how huge the dieting industry is, how much money it makes but yet there is still an obesity epidemic in this country? Sure seems to me that the dieting industry isn’t successful for the large majority of people but more for a select few (and good for them!). But for those that it isn’t successful for then they need other options so that they don’t continue to beat themselves up about their body when the standards that are set for them are unachievable for them personally. It’s thanks to people such as Audrey and Sophie Boss (and a few others out there) that people can start to feel better about their bodies, and not continue to live with the guilt that society places on their bodies and it is this freedom which is ultimately much more powerful than any diet. Personally, I read Beyond Chocolate a year ago and Overcoming Overeating and have followed their principals since then, well I should clarify, I have followed the needs of my own body since then, and not what some dieting giant tells me my body needs. Although I haven’t lost any weight (well, I don’t know as I don’t weigh myself regularly) my cholesterol has dropped significantly within that time and I haven’t went on any diet, or made any conscious attempts to cut out fats, sugars or salt. I also feel loads better about myself, exercise more and generally have a much healthier relationship with food. Now I can say no to chocolate, or sweets without even thinking about it, this is something that would’ve been impossible over a year ago. For that I am thankful for BC as it is helping me work through my food issues and maybe one day I’ll be thinner and maybe I won’t, but at least I can now say to myself that it doesn’t matter as much anymore. Before, I felt like losing weight was my whole existence, which is sad and ultimately that’s no way to live a life. Apart from stopping dieting I think it’s letting go of the guilt I associated with food. I was constantly feeding myself the wrong things, on both ends of the spectrum. When I was hungry for sugars from chocolate or sweets, I would have dried or fresh fruit instead, a nice ‘healthy’ option. But I would have tons of it, trying to fill the spot of the other sugars I wanted, so in the end I would still overeat, just with things that I wasn’t craving. Now, if I want chocolate, I have it and I don’t make myself feel guilty even if I have way more than I really need. Also, now when I want fruit, I have fruit and I don’t overeat as a way of filling a desire for something else. I listen to my body now and I can realise how detached I was from it before. I can tell when my cravings are real or a projection of some emotion, and crucially if I still eat when it’s a projection of an emotion then I don’t beat myself up over it. I’ve finally been able to re-establish the link between physical hunger and eating. Mentally I feel so much stronger and I no longer have to resist food anymore, I just want or don’t want things at certain times. I think the other principal that really helped me was movement. I’ve always exercised at least 3 times a week but before I would always choose things that would burn the most calories, tone the most muscle, anything that would aid me in my only goal of losing weight. I didn’t necessarily love these activities but I would do them because that’s what you ‘should’ do to lose weight. Now, instead of completing an exercise routing I don’t like 3 times week I move every day. I cycle to work (9miles/day), I do Vinyasa, Ashtanga or Kundalini yoga at least 3 times a week and I go for evening walks. I’m way more active than before and it’s sustainable because I’m moving my body in ways that I enjoy. What BC did for me was release me from the obsession – the obsession with food, exercise, weighing myself, guilt, temptation, willpower, resisting, my dress size, my past weights – so that I am I finally able to concentrate on things that really matter in life and stop this unnecessary stress. Thank you so much for taking the time to post this. What an inspiration you are for others! It’ll be interesting to see the show as you say, Audrey. I’ve been to WW more times than I care to count. On one memorable occasion, when I told the leader about crying for an hour because all I could have for dinner was some broccoli, I was told it was worth it because I had lost a full pound that week!!! I remember eating my entire days worth of points, and sometimes the day befores points as well on a Thursday night after being weighed. I remember being told to hand over my food diary for inspection and then told I’d obviously missed stuff off it because there was no way I’d eaten that little and not lost more weight. I no longer see myself as a ‘failed dieter’. Life is better this way – I enjoy food again and don’t panic when the shop doesn’t have exactly the right yoghurt/cheese/milk/bread/whatever that I’d worked out points/cals for…. Thank you Orlagh for being so honest and being willing to talk about this stuff so openly. I’m sure it will inspire others to feel less ashamed and self critical of themsleves. I just had to respond to the talk on WW… I have tried every diet known to mankind….and yes…they have all worked….mometarily..I have lost weight with them all and then regained it twofold. Why? Because diets like WW, Slimming World, Rosemary Conley, Lighterlife all work because they restrict the amounts you eat, everyone knows that less food and more exercise will ensure you loose weight. What they don’t tell you, and no it’s not even in the small print, is that dieting also teaches you to feel guilty if you don’t stick to the rules such as denial of wants, weighing food, weighing self, comparing yourself to others, judging yourself against external sources, all of which all aid anxiety and feelings of failure – it sets up the cycle of being ‘the perfect dieter’ and then ‘the perfect failure’ because a life of not accepting and understanding your relationship with yourself and (dare I say it) food, is simply not sustainable. We are pleasure seeking creatures…..who wants to pass up the doughnuts as they do the office rounds…..I don’t…. but I don’t want to feel bad about it either. With guilt comes recrimmnations, remonstrations, feeling bad about yourself, judging yourself to be less than, What a rollercoaster, where’s the level ground, up and down, up and down, much the same as my weight was for years. It was an absolute miracle for me to discover Beyond Chocolate, after regaining 3 stone after doing Lighterlife (my last ditch attempt to be a perfect 10). I just knew I couldn’t do another ‘diet’. You could say I ‘ate’ everything thing BC taught me, and you know what in two years I have not dieted once, I have listened to myself (tuned in), I have eaten what I want, and really enjoyed my food and my relationship with myself has improved beyond measure. I no longer constantly check the mirror to see if ‘my bum looks big in this’. Who cares….I’m in front of it ……no seriously…..my body hangups are gone, I enjoy my food and after years of living off ‘diet food’ I am eating real food that tastes divine. The results are that my chlolestrol levels have dropped dramatically, I have lost weight, but I don’t know how much as I no longer weight myself – how I got rid of my scales is another story – my skin has improved, my depression has gone and I can honestly say that I am the happiest I have ever been. Just wanting to leave you with a thought…WW also stands for World War….mmmmmmmm….food for thought, if you’ll pardon the pun. Thank you for a an inspiring story told with humour and feeling Sonia. The word diet should be banned. I’ve done em all. Ww, sw n rc. Yeah I’ve lost, put it on, plus more. I’m slowly taking on the beyond chocolate approach, but its a slow one. I’ve had an eating disorder, n have a negative body image. I have good days n bad days. But the million pound industry is not worth it. It can lead to obsessive behavior n negative thoughts of feeling a failure. Search for answers within not externally. So the likes of you with your non scienticically proven diet, jump on the band wagon trashing a companies good reputation and wait for it TRYING TO CASH IN off the ‘failures’ you have been talking about. You really ought to be ashamed of yourself if that is the only way you can get business. Seems like a vulture type scenario with you ready to peck out the sheeps eyes! Deary me, build up your own reputation without slating others! There is nothing scientific about relearning how to eat when you are hungry and stop when you are full – and there doesn’t need to be! What you fail to appreciate Lee, is that countless women have been damaged in some way by dieting. Yes some do succeed, but many, many others don’t for numerous reasons. It’s not a ‘one size fits all’ approach. Everyone is different and needs different methods and levels of support. I have spent far,far less money since ditching the diets and using Beyond Chocolate. I have not found this company to be anything other than nurturing and kind. They are certainly not ‘cashing in’, definitely not as much as WW and their ilk. You are not one to talk about slating others! I read an independent report into the diet industry which showed that 98% of people who join WW and similar organisations are not sucessful and leave…and re-join…and leave….and re-join. WW are great at promising amazing results, using celebrities and have the funding to launch very seductive advertising campaigns. Sadly, most women do want to lose weight, but most women find WW does not deliver permanent weight loss without rigidly sticking to their points and making them feel miserable. I joined WW recently and was shocked by how many women in their late 60’s and older were also long term members (and not at ‘goal’ weight). I do not doubt that WW works if you want to spend your whole life counting points and making it your life, but in reality, most people do not keep weight lost at WW off permanently unless they do it forever. Let’s look at it another way. Overweight means that one normally has an unconnected body/mind relationship. Would The Weight Watchers method work with alcoholics? Turning to food to solve one’s emotional issues is pretty much the same as turning to alcohol, although in most cases with less drastic repercussions. Well, I don’t think it would. The Beyond Chocolate method, at least partially, probably would as it teaches you to understand how to recognise your emotions and what to do with them and why it is you want to eat those remaining 9 Jaffa Cakes (as one lady described) once you have made your dessert with just two of them and to work mindfully so that you actually don’t care if you eat them or not and if you do, to enjoy them and not fester in the mire of guilt that you would were you doing WW. I note that most WW advocates commenting here are very defensive and aggressive. That’s not empowered. Look at how Beyond Chocolaters respond, with grace and calm. That’s because we are empowered and are learning /have learnt to trust ourselves and our bodies rather than a system. I am an ex-dieter and have been for 39 years including WW five times. BC is changing my life because it teaches me that I am unique and I know what’s best. Why does WW think it knows best for all those women out there, a huge percentage of whom just can’t seem to maintain their ‘goal weight’? It doesn’t. The failure rate proves it. The best piece of advice that has ever resonated with me about diets is during a conversation with Audrey and she said something along the lines of ‘it’s not the people who fail, it’s the diets.’ And it is so true. They are just not sustainable. And it’s really opened my eyes to all the fads out there that are literally feeding off people’s hope and insecurities and charging ridiculous amounts of money and making people feel miserable. Of course if you stick to a diet, any diet, it is bound to work. The discussion here is a little more complex in the sense that diets and dieting do not work long term because an overwhelming majority of people cannot stick to them forever and so any weight they lose comes back on, pus a little more usually. The diets ‘fail’ because they promise long term, sustainable weight loss and they just don’t deliver on that front. It’s made to sound doable and it’s not. This is not explicit, sadly so many women who attempt weight loss with diets and can’t manage to stick to them think that they are at fault and not doing something right when in fact they are being mislead and the product is faulty. In this way it’s a total fail. It’s interesting that those who have obviously trotted over here from the Dispatches comments page that are PRO WW find it hard to be civil. Mind you my attitude was like that when I spent my days writing down everything I ate, counted points, obsessively exercised, it doesn’t make for a good temper! My gripe with the likes of WW is that for the majority of people they DON’T WORK. That’s not MY opinion, it’s a fact, as the programme on Monday will show us. If it worked you would only do it ONCE. I am also taken aback by the pure hatred that some people have aired here. All the more so considering that the blog post is really quite level and civilised and it’s not even about Weight Watchers. For me it was more about giving all the women I know who are out there a space to talk honestly about what it’s like NOT to be a diet success story without being told that they are at fault for not doing it properly. I have to say that these venomous comments do not reflect well on the brand that they are representing. The thing is, when you’re in the throes of WW adherence, all you hear is that it will work if you do! IF you’re not losing YOU are doing something wrong. It must be hard, actually swipe that, it IS hard to then read someone questioning what is your lifestyle choice. I’ve defended diet clubs because I’ve been convinced by the hype, and wanted to throw myself in 100%, and how could I possibly succeed if I didn’t believe?! But then my reality struck, that at the age of 34 not one diet had been effective enough for me for it to last, and in fact I ended up with far more body issues than before. But that’s my lesson, my own learning, and I can’t force that on anyone, I can only be there to support someone who comes to a similar conclusion, and help them believe they are the wonderful person they actually are. I love your approach and you are right, we can’t force our learning and experience on anyone but we CAN share it with as many as possible, just like you have done here in the hope that they will hear and believe there is a different way forward. I am a WW member thaat found you through some1’s comment on the Dispatches site. I really hope that I dont come over as filled with hatred. Why have rejoined so many times? To be honest – money is main my issue – when things get tight obviously I discard the things of least importance. (always with the silly idea i can do it alone lol) I dont think many people can do it completly alone (hats off to those who can ) whether that is through weekly meetings or blogging or through chatting (like on here) most people require some level of support. I have had bad experiences at both SW and WW in the past with leaders and the worst experience I ever had was actually at a ww class ( about 10 years ago) which caused me to avoid them like the plague after that – I think things are now done different – people know more about what makes them tick. I have never dealt well with people laying down rules and just expecting me to follow them ( wasnt good at school with that!) and when people try patronising me…..well the least said about my reaction to that the better lol. Things have changed in the way the plan now is ( i feel it is a much healthier plan nowadays) and the attitude of leaders is not like the dictatorsip of old. All I really wanted to say is not all of us ww members are full of hate towards other plans, I dont feel i have to count points all day religiously ( there is the filling and healthhy ‘option’ of ww that wasnt even mentioned on Dispatches) I feel it DOES work for millions of people but obviously not for every1 – same as any plan really. I dont know enough about ur ‘plan’ (probs not right word) to comment just that at £150 for work shops and/or £12,50 (according to site) a week is out of my price range. I wish all ur followers the best with their journeys. Thank you so much for posting. You don’t come over filled with hatred at all. You come over as I imagine you to be….in good faith, trying to do the right thing. I hear what you are saying about the emotional eating – we do have dregrees in it – everyone on this site has which is how it all began. We ditched the diets all those years ago because none of them told us what to do when we were desperate for something – anything to fill that hole. It doesn’t matter if we binge on carrot sticks or carrot cake – it’s the shame and guilt and the pain that comes with being out of control around food that we look at. We can support you to do that even if you are still at WW. In fact, quite a few Beyond Chocolaters do both side by side and it seems to work. We know that support is crucial and you can have a go on our forum for free for a month and then for £20 a year which we think is pretty good value. You can also borrow the books from library at zero cost. Lastly I fully appreciate your comments about the convenience foods issue – in fact my next blog post will be about that and I do think you have a point that perhaps the people who would buy them would buy them anyway, WW or not. You’ve given me something to think about and chew on (bad pun, sorry!). Thank you. I read Beyond Chocolate when it was first published and I love what you do at Beyond Chocolate. I met you briefly Audrey at what is now the Vitality Show some years ago. What always shines through Beyond Chocolate is your genuine wish to help people. I am also inspired by your blogs and other output and know that over the years (scientifically proven or not) you have helped many people to feel better about themselves and set them on a surer footing to improved self-esteem. After working for almost 10 years for one of the companies you mention above, as a Consultant, then employed by the Company as a Team Manager (seeing what went on in 30 groups across a city), I ultimately left because I was so disheartened to see the “rejoin rate” and so few people shed the weight and keep it off. For four years now, I have had a hypnotherapy practice in London and so much of what I do has echoes of the Beyond Chocolate principles. Hypnotherapy is not for everyone either, just as slimming clubs or Beyond Chocolate isn’t for everyone, but thank goodness there is a choice and more people are becoming aware of the alternatives due to the internet etc. What I have discovered over the years is that there is no single right or wrong, or “better” way to achieve and maintain a healthy body. I too will be very interested in the Dispatches programme….I wish you all success in your endeavours. They do say that the most successful people in the world, in all areas of life, have “failed” more than anyone else. Their determination to succeed brings them ultimate success. Let’s keep going. After all, the quest to achieve and maintain a healthy body is a lifetimes work. Keep doing what you do Audrey and team! Thanks Clare, for your kind words, encouragement and willingness to talk about your experience of working with a diet company. It sounds like you have found a great way to build on that – I love that you are so open to each and everyone of us making the choices that work on a personal level. I don’t believe ‘our’ way is THE only way. It is JUST ONE alternative and I’m thrilled that there are women out there like you who are inspired by it and who create their own take on it. I’d love to hear more – hey I’m guessing all of the Beyond Chocolate community would – how about a guest post for our blog? Get in touch: audrey[at]beyondchocolate.co.uk. The thing about diets is that they set up a cycle of deprivation. I have definitely been there, done that and got the diet t-shirt. In my experience, every diet cycle correlates with an opposite (but unequal) binge cycle. The trouble with diets is that they address the symptoms – excess weight, rather than the CAUSE (using food for needs other than physical hunger). Diets don’t teach you to honour your hunger; or how to meet your other needs without food. It’s like a smoker with a smoker’s cough, taking cough medicine. It doesn’t handle the underlying cause of the cough, so the cough medicine won’t solve the problem. I have found that since I’ve stopped dieting, I’ve learned more about myself than I thought possible. My relationship with food is the gateway to the deepest part of me, and no diet would have brought me that much satisfaction, inspiration, insight or joy. My internal work on my relationship with food has positively impacted on many other parts of my life, which just isn’t available by dieting. I was under severe work stress at the time as well as having issues stemming from an abusive long term relationship I had left a few years before. I think once you have had anorexia you can never truly get rid of it but I found that following the Beyond Chocolate / Intuitive Eating approach helped me to improve my relationship with food and be a lot more relaxed about it. I aim to eat when hungry, eat what I think will hit the spot, and stop when satisfied. I don’t like feeling “full”. It is true that you will automatically “sigh” when the body has had just enough, and this is before you get to “full”. I still cannot weigh myself as it sends me into a torment so I have not had a scale in the house for about three or four years. As long as I don’t use a scale I am fine. I have stayed the same size for a few years now without going on a scale. The only time I am in contact with a scale is at the doctor’s once a year and I never ask to know the figure, also I don’t look at the dial. I think if you are vulnerable and under stress then a diet can be the dangerous touchpaper that lights the fire of a very nasty illness. Dieting is obsessive and not natural! Please stay away from diets if you are vulnerable. I would hate other women to go through this. Thank you for sharing that. I’m so sorry you had such a tough time and so glad to hear that this approach has helped. I just had to comment. Whatever size we are , whatever the issuesand behaviours with food we have we all have a relationship with our bodies. We are all the same. Sophie has taught me that anything I do is ok- I have a long history of severe Anorexia and the work I have done with Sophie has been the most self empowering. I have seen I have choices. Not a diet plan that I have to follow (ie number of calories) I think its good to have a meal structure plan to just support where I need to start ! Sometimes its a plate! Beyond Temptation is not just for overeaters- its learning to see food is not the enemy. I am surprised at the aggressivity of some of the comments. The dieting industry is exactly what it says, an industry, whose objective is to make as much money as possible. I don’t believe that Sophie and Audrey’s primary aim in setting up Beyond Chocolate was to make as much money as possible, but rather to share their experiences and innovative way of looking things and just by the by, find that they can make some money with it too. So what’s wrong with that? It’s about turning a passion into a business and I take my hat off to them. I doubt whether you will find anyone working in BC who doesn’t believe whole-heartedly in the BC way of thinking. I would bet my unread Dukan Diet book that those working in the DIET INDUSTRY don’t necessarily believe in what they do or sell. BC is not a product to ‘sell’, it’s a set of beliefs and a way of changing one’s mentality to a way that suits you. The Diet Industry doesn’t do that. It’s either stick to it or fail. I was put in my first diet at four years old. My mother put me on a series of diets continuously until I was old enough to diet myself which I did continously until two years ago. The psychological repercussions on the way that I have lived my life have made me miserable. I did WW five times. My first memory was when I was 13 and my recollection was of complete humiliation. However, I chose to go back every time I put on weight because, according to the statistics, it worked while you were ‘on it’. Most times I lost weight but put it all back in. The final time I didn’t lose any at all. And I think that’s the fundamental difference between the Diet Industry and BC. The former provides you with rules to follow that others decide for you. The latter teaches you a series of psychological dynamics that help you to decide for yourself. Deciding for yourself is empowering. Not living with guilt is empowering. Not feeling continuous self-hatred and self-disgust is empowering. Starting to respect my body is empowering. I am saying a MASSIVE thank-you to BC and Sophie, in particular, for helping me on this journey that is helping me to change myself inside and outside. When did WW ever do that for me? I’ve tried every diet too. WW, slimming world, rosemary conley, slim fast, calorie counting and not just once each, I tried each one many many times over the years. Occasionally I find pieces of paper in my chest of drawers with sums on them, my calorie tracking. Also on the same pieces of paper are my measurements that I took religiously. Waist, hips, left thigh, right thigh. I feel incredibly sad when I come across these reminders of how I used to live my life. Each time I regained weight the sense of failure was overwhelming. I thought it was ME that was at fault, that it was ME that was the failure when all the time it was the DIET that was the failure not me. This has been proved time and time again and I do hope this is something that the Dispatches programme makes clear. When I think of the madness of slimming club meetings, the humiliating clapping of weight losses, the tables groaning with products that bear no resemblance to real food being sold at great expense, the scales to buy, the measuring spoons, the special calculators, why can no one see that this isn’t how human beings are meant to eat. We aren’t failures. Our bodies are highly sophisticated and are more than able to work out what we need and when we need it. If we need outside help with anything it’s with showing us how to get to know and trust ourselves again and I strongly believe Beyond Chocolate shows us that. i went to weight watchers but soon dropped it as i was constantly hungry. i also tried slimming world, lighterlife, slimfast, calorie-counting, you name it, i did it. it never worked for me long term but i was always looking for the miracle diet which would allow me to lose weight without feeling hungry or deprived. but the definition of insanity is doing the same thing over and over and expecting different results. beyond choclate is just what we need. i tell people about what i’ve learned and encourage them to jump off of the diet wagon and embrace a more satisfying, pleasurable approach to making peace with their bodies. i no longer count calories or feel guilty if i’ve just eaten 3 or 4 of the cakes that have just come out of the oven. life is too short to go without simple pleasures or to constantly beat ourselves up for being not good enough. stop dieting and start living i say! keep up the good work. What a great way to start 29013 Alison! The best. I’m not surprised some pro-dieters have left negative comments. When you are invested in traditional weight loss methods like Weightwatchers, it’s really hard to hear the Beyond Chocolate message. I think a lot of people are under the impression there can be only one true path to happiness and that it lies in losing weight by dieting. Most often the dieting message is also quite punitive, and it involves a life-long commitment of time to attending support meetings, as well as often money in paying for that support. I’ve never found the Beyond Chocolate approach to be targeted at making money. It’s genuinely about having a healthy relationship with food, with your own body and with yourself. One of the most important BC messages is about being your own guru and not letting anyone tell you what’s right for YOUR body and YOUR wellbeing. I think in an age when the buzzwords are all ‘no pain no gain’ and ‘being bad’ and the word ‘sin’ is used to describe breaking a diet – well, that’s fine if you respond to angry, punitive messages, but a lot of us don’t. I’m not a child. I don’t want to be told what to do and what to eat. I’d rather trust myself. It was dieting that made me LOSE that trust in my own instincts around food, a long time ago, and it’s taken me many years to get the confidence to find them again. My relationship with food will be a life long problem – BECAUSE my mother put me on a diet when I was a child, and I developed an unrealistic and unnatural relationship with food as a result. I lost five stone on Weightwatchers when I was in my early twenties…but used to burst into tears when someone ate the last weetabix, or when I was walking down the street and smelled food from street vendors and couldn’t have any of it because I followed the WW points plan so strictly. I was slim but desperately unhappy, and it’s taken years for me to learn a healthier relationship with food. I dread the thought of going back to Weightwatchers. After becoming a lifetime member, and being feted for my weight loss, I found it an ongoing struggle, and my relationship with food was a battleground. I put that five stone back on, and some, as is so often the case with those who lose weight on Weightwatchers plans. I started out a size 18, went down to a size 12, but ultimately ended up a size 24 until a few years ago. Now I’m a size 18/20 again, but that’s just my dress size – not my whole being or sense of self-esteem and self-worth. I would never go back to Weightwatchers. I am much happier since embarking on a journey to discover a healthier relationship with food and my own body since finding Beyond Chocolate. It might be a slower journey, and a more personal one, and one devoid of quick fixes and buzzwords and punitive rhetoric, but it is more sustainable and more satisfying, and it doesn’t require me to shell out a lot of money every week to be weighed and given a diet plan that won’t work for me in the long-term. I’ve been to WW twice, lost weight twice and regained it (plus more) twice. Weight I’ve lost on any other ‘diet’ has also been regained. I’ve binged and judged and monitored and weighed and ‘started tomorrow’ for years and years. It simply is a horrible way to live. I discovered Beyond Chocolate many years ago and although I still struggle with ‘diet mentality’, my relationship with food and my body is very different now. And in response to the comment by ‘Lee’ that Beyond Chocolate is another money-making machine – in the five years I’ve been aware of Beyond Chocolate the only money I’ve spent is on the book, which I’m sure is a similar price to ONE WW meeting – hardly a money-grabbing scheme! And if I didn’t want to buy the book, I could get it for free at my local library. That’s the beauty of Beyond Chocolate, it costs nothing to follow the principles or read the blogs and website. You don’t have to pay to go to workshops or ‘meetings’ before you’re given a ‘program’ to follow. ‘Lee’ and ‘size 10’ I feel very sad for you that you can’t see how the diet industry dupes people. The fact that you’re even on a Beyond Chocolate forum suggests that you’re searching for something other than whatever diet it is your following. Do yourselves a favour, go to your library, get Sophie and Audrey’s book and try something different – it won’t cost you a penny. Thanks for your support Sam and I am so glad to hear that you borrowed the book from the library – libraries are such underrated places 🙂 We are in the process of re-evaluating everything we do and all the courses and products we have on our website and we will very soon be offering LOTS more for FREE. I think what I find most fascinating is the number of people who will say ‘WW/SW/RC work for me- that’s my best diet’ – when what they mean is that they’ve been on it a number of times, lost and regained weight – but that still seems to count as ‘working’. I love the journey that Beyond Chocolate has set me on – about 4 years ago now I think – and have remained the same weight all that time. I don’t have ‘good’ food or ‘bad’ food now. I eat when I’m hungry and I eat what I want to eat. I’m kind to myself when I realise I’m eating out of emotional need. I’ve found an exercise I enjoy – and I do it every week because I want to. I can’t wait to see Monday’s programme! I have been a member of WW more than once, Scottish Slimmers several times, Slimming World and a couple of others. The most I lost at WW was 50lbs (the first time) and at Scottish Slimmers I lost nearly 6 stone over a 9 month period. Of course these weight losses did not last and any subsequent attempts were not as successful. The deprivation is awful, I remember feeling hungry, stuffing myself with vegetables in order to fill myself up, making SS corned beef hash – basically limited potatoes, limited corned beef, and onion all mashed together. It was not a big portion so we were advised to add swede and carrot. This was cheap and easy so I ate it a lot. How can WW members say that they can eat anything they like and still lose weight? What about full fat mayo (the reduced fat stuff is full of chemicals), butter, olive oil on your pasta, cream? The Beyond Chocolate approach is not easy but it is so much less damaging to your morale and your nutrition than a diet. Yes, you get a huge high when you lose weight, but unless you continue to deprive yourself constantly that weight will go back on extremely quickly and will be much harder to lose the next time. Not sure if I am a ww success I have done ww a couple of times and then stopped when the going got tough and put the wieght back on. Have also done slimming world, been to inital meetings for lighter life, bought hypnosis tapes, calorie counted done the GI diet and worked through a book, the no diet diet (which is very like your approach the primary aim is to improve your life not lose weight!) however it was my wieght that was having a negative effect on my life so that was what I needed so sort so 2 years ago I went back to weight watchers. I have slowly over that time lost 4 stone, but more importantly I have discovered how to really enjoy my food, in a sensible way so I can go out socially as often as I want and eat normal food at the same time as I am reducing my weight and the pain in my joints – I have just read your blog about peppermint creams and think I might make a batch myself this afternoon. I will work out the points and I will take my time eating them over a number of days so I do not go over my ‘budget’ because this is the way I live my life now. I have no doubt I will carry on til I get to goal and I will stay there. I posted on the dispatches post and I know a number of others from my meeting did as well, not because we are leaders and paid by them but becuase we do not want one overweight and miserbale person put off off going to a weight watchers meeting. If I thoought the dispatches program was going to do a fair comparrison with methods of weight loss and the cost of each that would be brilliant – but I bet it wont. Not that they could compare your method as you don’t even pretend it is efficient at weight loss, just improvign your relationship with food which is very difficult to measure you must agree! Thanks for your thoughts and for sharing your experience of dieting. I hope that Weight Watchers works for you long term this time round. I think that most of the women who decide to ditch the diets do so because at the end of the day they are not willing to ‘budget’ their food for the rest of their lives. If you are willing to do so and can manage that then it’s really great and I am delighted that you have found a way forward that works for you. Precise and scientific measurement of an improved relationship with weight loss may, as you say, be more complex to measure than straightforward weight loss but I think all you need to do is read the dozens of comments above made by women who say their relationship with food (and their body incidentally) has improved and there can be no doubt that it is effective, liberating, life changing and long term. Weight loss is a bit of a red herring. It is touted as THE solution for everything: health, happiness, acceptance, beauty, success, fitness. In my experience, weight loss is just one factor that impacts all of these things and what I have seen is that many women who step off the dieting treadmill and work on their relationship with food and their body instead of focusing on losing weight come to the conclusion that they don’t need or don’t want to lose weight after all. They also report being fitter, healthier, more accepting, more successful and generally happier than they were – without losing a single pound. Of course, for some weight loss is still something they want very much and for some, indeed for many, it does come as a result of having a healthy, balanced approach to food but you’ll find that’s often not the first thing they mention anymore. I woud guess you were never 7 stone overweight and finding every step extremly painful and thus finding it extremely difficult to live a normal life. Excess weight crushes peoples literally as it was doing me. You cannot be heathly and fit at 7 stone overweight I tried to convince myself that I could for a very long time. I wonder what I would have learnt if I had come to you at that time, and how you would have helped. Losing weight is what has got my life back not justifying to myself that it is the diets that have failed and not me and you make no promises on that although you obviously attract alot of people who want to lose weight. ww say you will lose weight at a sustainable rate if you stick by their framework and people who do do lose weight. Obese people will be healthier and happier if they lose weight simple. The pro ww brigade feel strongly about this because of the number of obses people who will be put off going to ww and getting hte help they need by the dispatches programm or the negative comments about ‘dieting’ on this site. Thank you for your comment and for taking the discussion forward. Many obese women who come to us have followed Weight Watchers and other weight loss programmes time and time again and despite being 100% committed and giving it their all, they have ended up heavier than when they started out. You say that by sticking to the programme it works. I can guarantee that if you “stick” to the Beyond Chocolate principles – with the same unwavering focus with which you stuck to WW – you would also lose weight. The reason we do not advocate this all or nothing approach is that we know that most women find long term restriction impossible. They stick to it for a while and then as soon as they stop they put all the wight back on. With Beyond Chocolate the focus is not on the weight and the weight loss but on the behaviours and the lifestyle that created the weight problem in the first place. We don’t just tell people to stop overeating by showing them how to consume fewer calories. We guide them to an in depth understanding of the reasons why they overeat and show them how to manage the urge differently. The result is that they eat less and more importantly they come out the other end with more understanding about themselves (which impacts every area of their lives, not just their size) Many of them have lost weight. Some have lost a lot of weight. And as I said in my previous reply, this is not what they talk about first and foremost. I hear that Weight Watchers is working for you and that your life has considerably improved as a result of having lost weight. In the end, slimmer than you were, it doesn’t matter how we get there. If WW has worked for you then this is really great. I am not being flippant here. I don’t have an issue with WW when it works for someone. What I know is that there are thousands and thousands for whom it hasn’t worked. Those who do lose weight, put it all back on plus more and who end up fatter and more miserable than before. We get a lot of women coming to us saying that they are ‘helpless cases’ because they can’t lose weight with diets. I feel as strongly as you do that these women should have an alternative instead of giving up all together. Beyond Chocolate and all the mindful eating – intuitive eating approaches out there offer these women an alternative to go forward. It’s funny how the above has become polarised into a debate between “beyond chocolate” and the diet industry, as if you have to belong to one camp or the other. I’m a big fan of the beyond chocolate mind set, though I’ve attended nothing, read little, and simply dipped in and out of blogs and FB pages when I feel like it. I realised before I even heard of BC that for me, dieting, whether under the auspices of WW and the like or independently, is tantamount to self harm: a repeating cycle of physical damage followed by self-loathing. It has taken nearly as much willpower to stay away from diets at times when I’ve felt bad about my appearance as it did to stick to them! But once it became clear to me that no diet could “fix” me, and that I was using them to perpetuate feeling bad about myself, I viewed never to diet again. The key difference since then has been impact: I no longer obsess about my weight or food. I have more self confidence. The effort of not dieting has mostly passed, and best of all my weight is steady (I don’t weigh, my clothes tell me). On occasion, I may put on a few pounds. I notice. I keep listening to my body’s advice, what it tells me it wants or its tired of. The pounds fall away. There’s no angst, blame or effort, and it costs me nothing. There is no “doing it right” or “wrong” or being “good”. Just me in my bod. Yes, I’m overweight, but I’m also relentlessly healthy, and comfortable in my skin in a way no diet ever delivered. I recommend beyond chocolate because they describe and support beautifully what I’ve found for myself to be true, and one day when I have the resources to train I’d like to become a chocolate fairy. I do know people for whom the big diet regimes have seemed to work – but more for whom they have not. What’s important is to be honest with yourself about what’s good for you, for the whole of you, and stick to that rather than any sense of obligation based on what other people say or, God forbid, brand loyalty. you fail. I wish I’d kept all the weekly fees I paid, and the money spent on calculators and chocolate bars and bonus buddies. I could get myself a hOliday with all that wasted money. I have spent very little on Beyond chocolate and hope to go to a £10 workshop if it comes to Manchester and is not on a Saturday. I am not in a good place right now in terms of health, and I do not have the energy for anything right now, but I HAVE lost half a stone eating what I like and following the BC principles and I have far more faith In that than in the multi million pound dieting industry. I felt compelled to reply to this. It is a fact that diets don’t work for the majority, the statistics back that up and no-one can deny it. There are a few for who it can work, and live their lives religiously tracking everything. That’s fine for them, but I wonder how many of them are binge-eaters on the quiet? I have been to WW many times (it must be in double figures) and have got to goal a couple of times but the rest I have failed at. This has definitely made me bigger than if I had never gone at all! Their dieting/health/nutrition advise is wrong in many cases, and when you look at the science of it not much of it makes sense. I will not be going again. My mum started (again) in her early sixties and the weight loss was very slow, and she was told it was her age. The amount she could eat was pitiful; is it any wonder we lose sight of what our body needs? My biggest regret with all the dieting damage I have done to myself is that I have lost the ability to eat instinctively; I no longer know what I want to eat, only what I “should”. I am really trying to get to grips with this, but still have a lot more binge-days than good ones. This is the diet industries’ fault, not mine. For those knocking the Beyond Chocolate way of thinking; read the books one day and I guarantee you will see yourself in their examples. All the pro-WW “success stories” posting on here; please come back to us in 10 years and tell us if you are still at goal. Once upon a time man thought the earth was flat and the sun orbited the earth, are you really so confident that these “diets” work? Is WW Gold Memberhip when you hit target you get free lifelong membership? -erm does this mean they expect you may be back? Because of diets I have developed the most screwed up relationship with food and my body. Over the past couple of years I have gone to a size 14-16 to a size 8-10 and now back to size 10-12. I have joined a gym gone on diets obsessed over calories, obsessed over what I ate, what I looked like and how much I weighed. Even when I was at my thinnest I still wasn’t happy with the way I looked. I’m only just starting to realise what poor body image I have and how mirrors can really screw with your head. I also tend to binge eat and because of my medication I am usually hungry all the time so in order to maintain a “healthy” weight I have to eat extremely healthy and or exercise excessively. I also have a naturally curvy body which I need to come to terms with and learn to love my curves instead of trying to squeeze back into a size 8 in which i once fit into for a very brief period in my life. I hope people can read this and know how I have felt….I think I need to take another read of beyond chocolate (I read it almost 2 years ago) to screw my head back on and get rid of these negative thoughts. This makes me feel so sad. Not sure if I can watch this programme as WW brings up some difficult issues for me…mostly the time and energy I’ve in the last 25 years of my life worrying about my weight, realising that I was a long way from my goal weight. Would I ever be an acceptable size in society or by the WW community..? I feel very angry that I was ever introduced to dieting or taken along to a WW meeting. Thank you Sophie & Audrey for giving me my life back and making me realise I have a choice. A choice to make my own decisions on what I eat and when. I am no longer a slave to the scales or the latest WWers plan and eat whatever I like without guilt. I don’t remember anyone ever dying from eating cake. ‘Slimmer than I was’ makes a very important comment in her second post above and it has been ignored. Above a certain weight life can be miserable. Not because of vanity/peer pressure/fashion-consciousness/the media etc etc. Above a certain weight life can be miserable (indeed can seem like no life at all) because carrying that much weight is physically painful, constantly. Every step is agony. Your life shrinks as you get heavier, until you are merely existing because you are – literally – disabled by your weight. It’s all very well to say “health has nothing to do with weight” and that’s probably true for people with BMIs up to say the very low 30s. But above that mobility, joint pain, back pain, foot pain will all take a severe hammering, leading to immobility (and concomitant reduced fitness and health) and – in many cases – depression from chronic pain and no “living”. I absolutely agree that people who are say a size 16 instead of a size 10 should stop worrying and start living instead. But people who are say more than 5 stone overweight are often DESPERATE to lose weight – for reasons that are entirely related to physical pain and lack of mobility. I have never seen that fact acknowledged, much less addressed, on the BC website on or the BC book. I’m sorry Aggie, I disagree with that. I’m currently at a BMI of 43 (or thereabouts – I’ve not weighed in a few months so I’m unsure). I think I’m about 8stone over where the BMI says I should be. You know the thing about the BMI scale? It was never intended to be used on individuals. It was only ever intended to be used on populations as a measure (not *the* measure, but *a* measure) of whether enough food was available in that population. Added to the fact it was then messed about with by insurance organisations – it bears no reality to what is healthy and what isn’t. I’ll probably never run a marathon, but my blood pressure, cholesterol, heart rate, blood sugars etc are all well inside what is normal. I can walk where I want to – except when my plantar fasciitis plays up which is a hangover from a childhood spent climbing over walls and ditches and doing fabulous damage to my ankles – and my weight doesn’t inhibit the life I lead. Health can’t be assessed just by weight alone. There are so many other measures of health that can accurately tell you what’s healthy and what’s not. I know the NHS doesn’t want to publish this since obesity has taken over from where smoking left off, but even in studies on diabetes, it is not certain whether weight gain is caused in some cases by difficulties in insulin regulation or whether the weight gain causes the insulin regulation difficulties. There is a correlation but not a causal link. my life is a lot bigger now since I accepted my relationship to food, readjusted it and started to enjoy life a bit. Any by bigger – sizewise I’m no bigger, but in attitude I am. I’m way more willing to tackle the world head on now than I was before – even in those periods I was thinner. Have you ever attended a WW Meeting ? Yes, I followed the WW diet four times and went to meetings every time. Once, I think the second time, I got the gold card. Yesterday I spent the day in the company of 8 amazing women who came to the one day ‘The Principles’ workshop I lead in London. Between us we counted 219 years spent dieting – that’s three lifetimes of 70 years (although hopefully we will all live longer than that!). Each of those women had tried well known commercial diet after diet without sustainable success as well as a good few ‘home-made’ ones over that time. They were at the workshop to find a way forward – a way to get back in touch with themselves and their hungers and to learn to trust that they can find a relationship with food which is calm and comfortable rather than about stuffing emotion down and deprivation/binging. Diets do not teach us how to manage our emotions without using food unsustainably. I have been working with the Beyond Chocolate approach since 2005 and I now recognise often my urge to eat for emotional reasons and sometimes I still choose to do just that because it seems easier in the moment. Emotions can be painful – emotionally and physically painful – and we have learnt to use food to numb the pain because at some stage we needed to do just that to survive what was happening to us – it was a functional and sense-making response at the time that no longer serves us well. It take open and curious attention, self-care, motivation and time to gain awareness of and change our old, self-protective patterns. Dieting is an external solution to an internal situation – as so many of us know it offers only a short-term and ultimately damaging fix for many people. I agree with Aggy. Love the book and the work you do but there is a huge difference between being a size 16 and a size 26 with a lifetime of disordered eating which has contribute to extreme weight gain which can severly restrict your mobility and can impact on your health. Yes, I agree that there is a huge difference. Sadly dieting helps these women (women who are many stone overweight) even LESS than the women who only want to lose a smaller amount of weight. I have worked with women who have had bariatric surgery, lost 7, 8 or even more stone and still ended up with destructive relationships with food, bingeing and putting the weight back on. I don’t know if you have read our second book, Beyond Temptation? In this book we talk more about overeating behavior and how to manage it. That’s the key. There is little point just telling women who overeat to stop and eat healthily and move more. It is only when, with support and compassion, they begin to understand why they overeat and are given tools manage that urge (which many women call compulsive) that they can truly lose weight for the long term. We have never said that weight loss is not a legitimate aim. What we are saying is that by telling people what to eat and how much to eat we are not giving them the tools they need to mange when every bone in their body wants to dive into the oblivion of the biscuit tin. When I was at my heaviest and most desperate Monica, I binged every day. I ate packet of crisps, one after the other, I stuffed down KitKats followed by olives, cheese, anything I could get my hands on. I overate at every meal. And when I went to the WW meeting and was sighed at or tutted at for ‘having a bad week’ it didn’t help. Sitting through the sessions where I was shown how to make a sandwich go further or how to swap the chocolate cake I craved with a WW chocolate cookie didn’t help. I would go home knowing that I needed to eat less and eat less crap to boot, and I had no idea of HOW to do that. I had not idea how to stop the cravings. I drew on all the willpower I could muster, and sometimes I would manage it for a few days or a few weeks and I’d lose weight. But then the floodgates would open and I’d be back to stuffing my face and I’d put it all back on again. And all the while I felt so guilty, I hated myself so much because at the meetings I was told it was simple and straight forward, like some people have said here in their comments – just stick to the plan – and since I couldn’t, really couldn’t, even though I desperately wanted to and tried so hard, I thought there must be something fundamentally wrong with me. And I would just end up eating more to drown those feelings of desperation. I couldn’t stick to the WW plan because my eating wasn’t a conscious decision, it wasn’t something I knew how to control, at the time, and WW didn’t teach me how to do that. I was desperate to stop I just didn’t have the tools or the real understanding and support to do so. That’s what we give women Monica. A place and a way of dealing with their overeating which really helps them to eat well and feel good about it for the long term. I hope that helps you understand a bit more about what we do. If WW works for people, that’s fine with us. We are not talking to them and we have no desire to tell them not to go to WW. Our aim here is to provide a space for women who have tried WW or other diets again and again without success and to let them know that they are not alone and they are not failures. 5 years of trying to lose weight and it’s seen me arrive here. A stone a year. A year of trying hard to follow some plan, then feeling dismal because I gained or maintained, or occasionally lost only half a pound. Now I’m not saying, and I have not said that WW or SW does not work for anyone. There are many happy people who’ve changed their eating and stuck there. There are others though, like me, who feel more and more the failure when instead of losing and staying there, we gain or maintain. We’re failing the diet. We have no will power. We’re lazy. It’s great if something in you clicks when at 5 or 6 stone overweight you can achieve all you want through one of the diet clubs. Kudos to you! You’ve got it. But does that mean that those of us who haven’t clicked in the same way as you should feel shamed or humiliated, because our fat and our discomfort isn’t enough to get our big asses into the gym 4 times a week, and drinking point or syn free soup 3 times a day? What I DO know, is that by taking that self loathing away from myself, by being loving to myself and by avoiding all the self berating diet talk I am starting to treat my body with the respect I deserve. I am training for the moonwalk in May, me and my big old body that has had enough of dieting. I am walking 6 miles a day on a fairly regular basis, not because some gym bunny or class consultant is telling me I need to move, but because I feel good doing it, or at least after I’ve done it. I am so delighted, honestly, truthfully, for those of you who don’t have issues around food and have lost weight and kept it off. I am glad that you don’t have to go through the mental anguish, and self learning and understanding that I seem to have spent the last five years going through. Exploring why I have such food issues has been emotionally challenging at the very least, and is an ongoing learning curve. But by the end of my journey, I will be at a HEALTHY weight, with a healthy relationship with food. And again – inspiring. Thank you for this. I am sure that others reading you will feel inspired to do things differently and more importantly that they will know they are not alone and not at fault. We seem to arrive in adulthood blaming ourselves for so much, and allowing others to blame us too. It’s so much easier to blame ourselves rather than question what we’re actually doing and whether it actually has any merit. I do hope that those people who haven’t been successful on WW or SW or whatever can read this and see an alternative. I thought the dispatches program was terrible and it is such a shame if it puts people off of joining weight watchers and for many, losing weight. After attending weight watchers for almost a year I have lost 2 stone. I never expected to make friends and I love that I have. For me, it is the support and the meetings that I feel happy to pay for. I also eat some weight watchers food products, but not all of them. It just doesn’t feel like a diet to me, it feels like a lifestyle change. I love the activity points idea and I do more exercise nowadays. It gives me the feeling that I understand the recipe to success in terms of weight loss. Whether a customer decides to use that recipe or not is down to them, and I do not think weight watchers is to be blamed at all if people do not stick to the plan. There could be a more CBT approach included in the plan, and it would be great if the leaders could be more emotionally supportive, but I already see my leader and my old leader doing as much as they can, as they have very large groups of people. This is something that the company might consider looking into the future as I think it would boost the rates of people keeping the weight off. I have been overweight since a child and have been to the doctors asking for help since I was a teenager. Unfortunately I never found the support I needed. I also attended slimming world in my teens, however I found that the nutritional basis didn’t sit well with me, plus, I thought the idea of ‘sins’ was extremely strange. I have never felt more in control when it comes to my weight and I really do thank weight watchers from the bottom of my heart. The program was upsetting for me as I know how well so many people have done and how hard we all work to get where we get to. It cast the leaders in an evil light where they are people who have come a long way themselves and this should be celebrated. I believe that nutritional education, encouragement to exercise, support and consistency are the key ingredients to healthy and long term weight loss and I genuinely believe that weight watchers offers these things to their customers. The way that they wish to use it or not is up to them. Thank you, reading the posts above had been very interesting. All the best to everyone and I hope we all find happiness within our skins. thanks for your comment. I started to reply and then realised that I wanted to write a blog post about it because I had lots to say. I’m working on it….and will post it soon!